Weather.com (and my mother) tell me that my North Carolina hometown is rocking 87 sunny degrees right now but here at glo headquarters in Denver, winter and spring are still playing tug-of-war. Last weekend I sat on my porch and soaked up some sunshine between piles of ice and snow (not without SPF-- I keep my complexion healthy, protected and pretty with gloPressed base in golden medium, of course!) The peek-a-boo spring days give me just the inspiration I need to try a something new to celebrate what's coming (warm weather!) 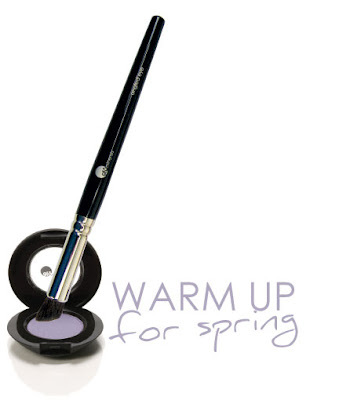 Here's what I'm loving now -- fresh eyes with gloEye shadow in lilac washed over the lid and just under the brow bone, then contouring the crease with one of my favorite light browns (I'm obsessed with twig.) Sometimes I layer that over a bamboo base and I always use gloLid primer so what's pretty at 7 a.m. before work is still pretty at 6 p.m. for happy hour. I've also been into pretty pink blushes and irresistible lashes that do resist water (gloWater resistant mascara is the ticket.) So come on over to Denver spring - I'm warmed up for the warm-up.